Virtual Business Card Template is a very common but effective way to show your professional talent to others. A Vcard represent a great aspect of the online world for freelance web designers, content writers, photographers and other professionals. 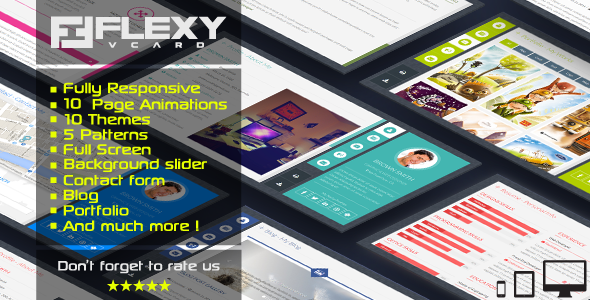 Today, we are going to show you 30+ Best HTML Responsive Virtual Business Card Templates 2016. Enjoy ! With an resume online you will easily presents the ability as well as the tasks you can perform. A more complete profile of you as easily seduced as well as attracting the attention of the visitors. These templates are we chosen below are the modern design trends, fully responsive, retina ready and integration of increasingly powerful technologies such as HTML5, CSS3 and BootStrap to provide detail oriented user experience enhancements, that are both passively and actively interactive, keeping visitors engaged and entertained even after they’ve lost their initial spur of interest. Nowadays people are opting to create virtual business cards that can be directly sent to associates directly online. This post will give you a walkthrough of what Virtual Business Card Templates are the best. 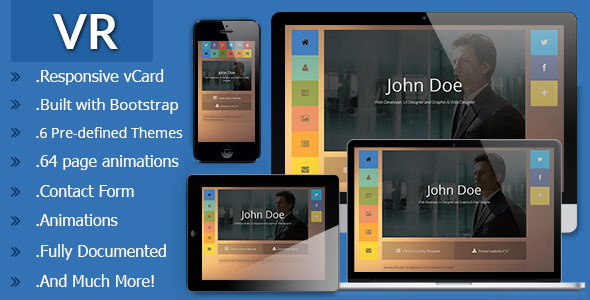 Choose your favorite HTML virtual business card from thousands of available Responsive Vcard Template designs. 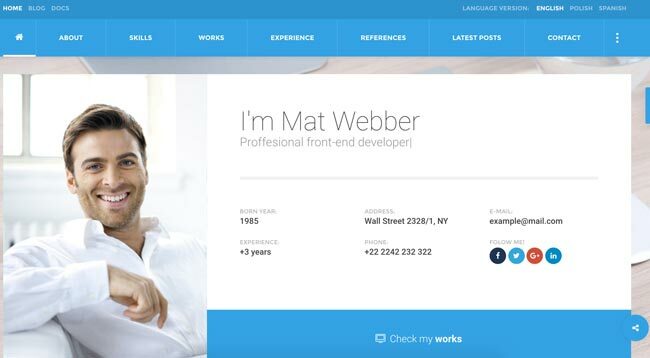 I’m Mat is a fully responsive, Material Design style, Retina ready, HTML5 and CSS3 personal, Resume, CV vCard Template perfect for a resume, vCard site for everyone, It based on latest Bootstrap framework so work awesome on any devices. I’m Mat offers 4 demo layouts for all sorts of vCard related sites, and with its Video Background, Slideshow Background and 8 Color Schemes , you can effortlessly transform them into any styles you need of your Personal vCard website. Your Card page can feature beautiful customized typography, due to the addition of some incredible Google Fonts, 500+ Icons. Basically, I’m Mat provides you with a great medium through which you are able to present the strengths of yourself and the services you offer. 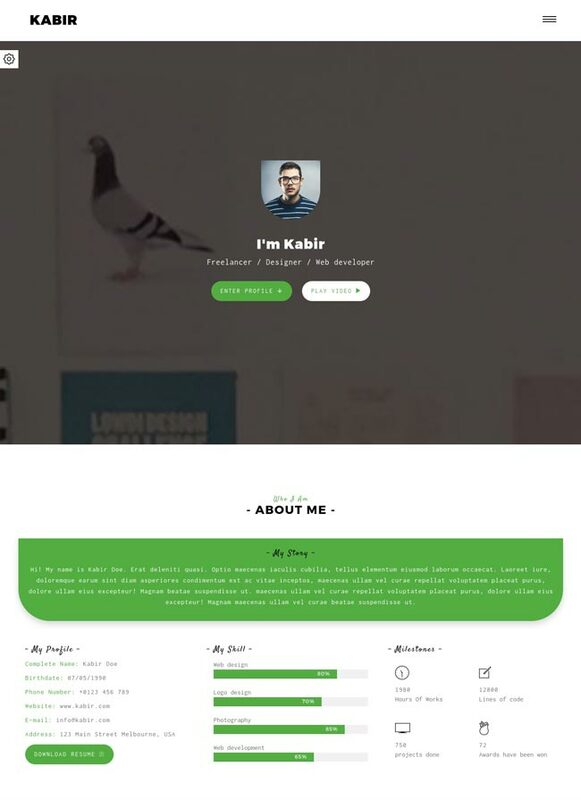 Kabir is a creative, HTML5/CSS3, Bootstrap framework and fully Personal, vCard, Resume CV, Portfolio Template!, It includes 9 pre-made color styles, 5 different Concepts such as Personal, vCard, Resume, Portfolio and Blog, 3 Pre-made navigation menu styles. Kabir incorporates flat and clean design elements that subtly illuminate the user’s navigational experience all over your website, from subtle hover intent detection animation to ripples around clicks, elements come alive in Kabir. Unlimited color combinations, Google fonts, Google Maps with enhanced legibility and code optimization complete the package will help to customize the template very easily. PHP form integrated for contact or submit inquiry. Kabir is a theme that is truly something special! 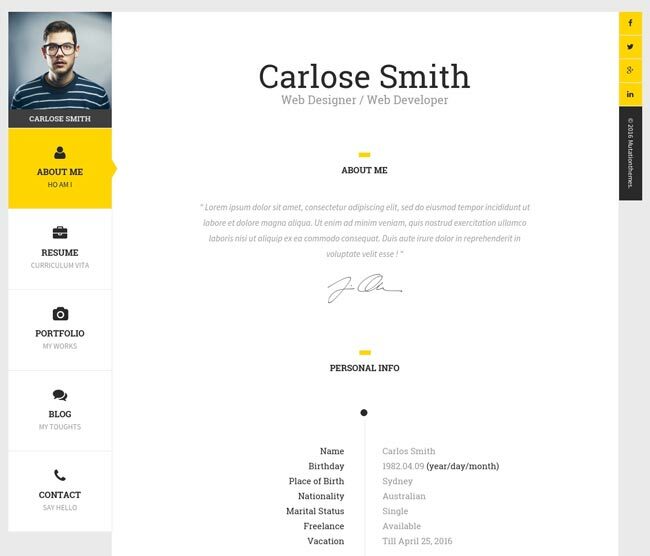 Tayn is a fully responsive, creative, modern customizable, visually stunning Resume/CV/vCard material design template built around the needs and necessities of personal vCard online. 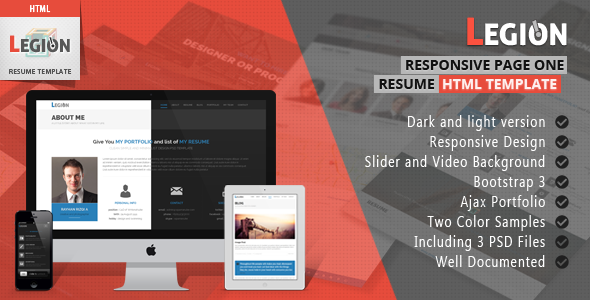 With 9 different colors schemes of your single resume page style alter the tone of your website with the touch of a button. Retina ready graphics and Ionicons, Linea Icons are included, as is a responsive compatibility with absolutely any device, even any device not currently on the market. 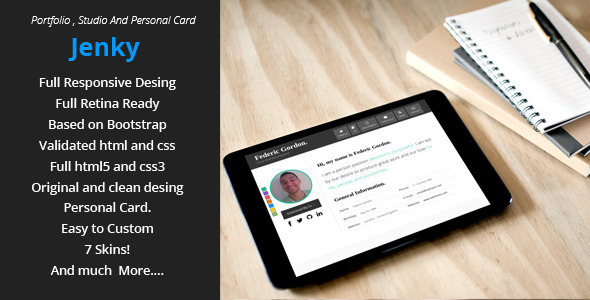 Tayn is perfect way to make your online profile and portfolio to describe yourself. Empathy is an modern and clean virtual business card templates, It is the reformer way of representing your online identity. Empathy built with HTML5 and CSS3 technology, with unique layout and sleek design will show what you have to curious eyes. Fully responsive design, retina ready and icons are included, and your own images will look fantastic on any device they’re rendered on. Google Maps, contact from integration will help visitors connect with you quickly. It has plenty of customization options that you can tune it up to reflect your style in minutes with no hassle. 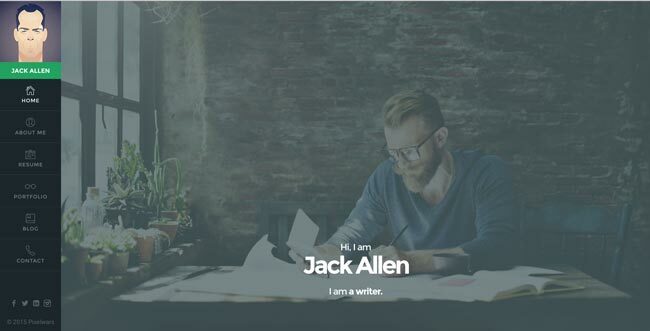 Mi is an ultimate, fully responsive, retina ready personal resume vCard template, it comes with 42 unique demo versions for career as IT, Architecture, Law, Medical, Beauty, Trainer, Manager, etc… Mi built with HTML5/CSS3 and based on latest Bootstrap framework perfect as a resume / vCard site for everyone. Mi pre-designed modules and pages such as Video Background, contact forms, blogs, and an endless array of options, all in turn unfathomably customizable. 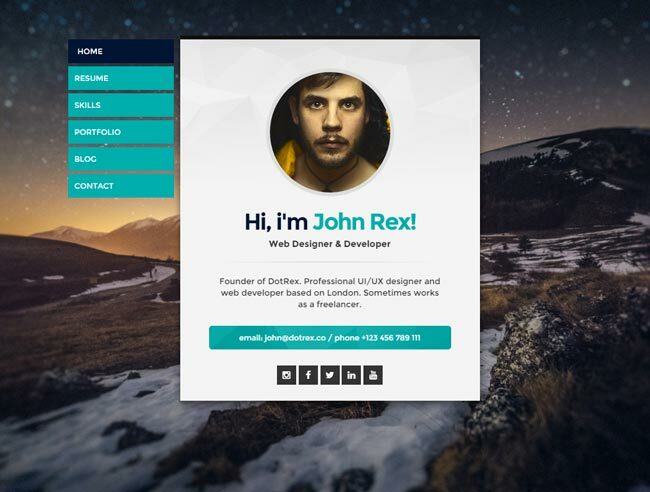 Cards is a modern, exclusive and flat Virtual Business Card Templates great for designers, programmers or photographers. 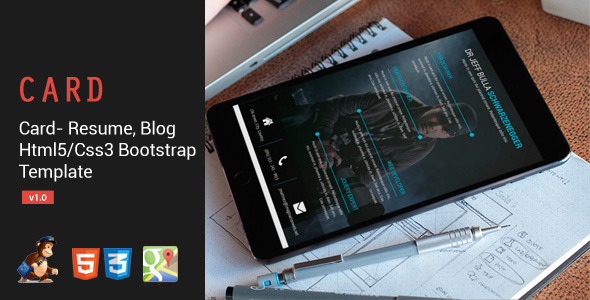 A fully responsive, cross-platform-compatible BootStrap 3 framework design offers interactivity and smooth reactions to user actions that engage potential employers and make your website both lively and intimate. Retina ready high resolution graphics and 300+ Font Awesome Icons are included, and your own images will look fantastic on any device they’re rendered on. 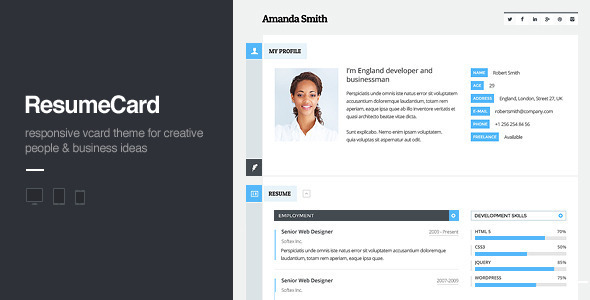 Cards is the one stop solution for all your career building professional vCard, CV, Resume and Portfolio site needs. 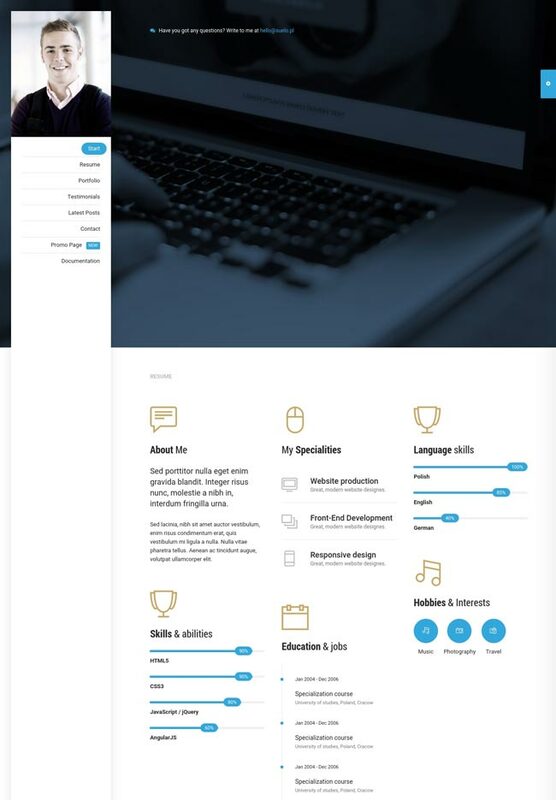 Joyson Personal is a Responsive Resume / CV Vcard Portfolio HTML5 Template which has been built using the Twitter Bootstrap 3.0 framework. Gentleman is a minimal and clean One Page HTML5 Template which has been built using Twitter Bootstrap framework. Well commented and organized codes will help to customize the template very easily. 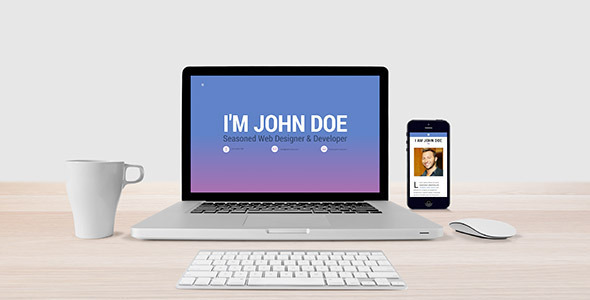 It’s me is a Professional Responsive Vcard Personal and Portfolio Resume HTML5 Template which has been built using Twitter Bootstrap framework. 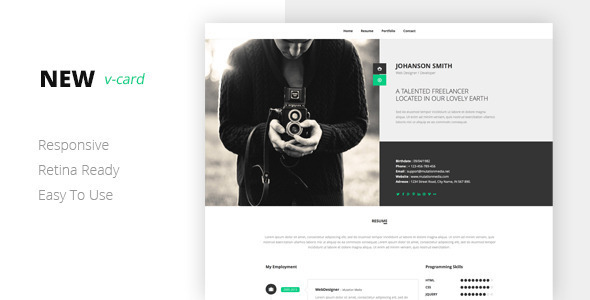 MePro is Creative Personal & Portfolio template, With useful features make MePro the perfect templates for your Personal Page. 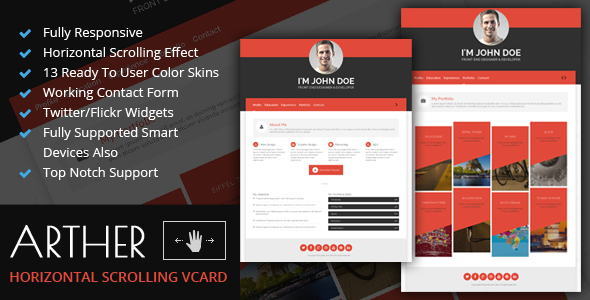 Bounce Vcard is a modern and beautifull personal showcasing template coming with several section to display a lot of information and list your education, experiences and works. MongKok is a modern onepage resume / personal web template built on Bootstrap 3 with lots of options for customization. It features a resume section with clean typography and animated charts, a portfolio section and a book section. With the code snippets page that comes with the template, it is easy to create your own contents that are consistent with the template in terms of style. Identity is a multipurpose, modern and well crafted one page portfolio for creative professionals. Anyone can showcase their personal resume, work history, education, projects and other personal information beautifully using Identity. This is built with modern technologies like HTML5, CSS3, jQuery, Bootstrap 3. It is fully responsive with clean modern design. Arther is a clean, minimal, flat horizontal scrolling template. 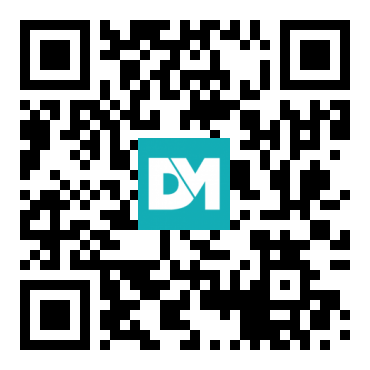 With support on all kinds of modern devices, now you can spread your work worldwide easily. The user can drag between you pages on smart devices like Iphone, android phone, ipad and tab. So this features make this template a very powerful theme which is best for freelancer. 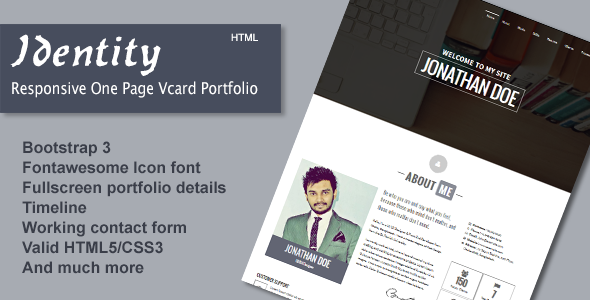 NEW V-card is an easy cutomizable v-card/portfolio/mini website template made entierly 95% with html and css it allows you to introduce yourself with the most important informations to your features clients or employers. VR is a vCard HTML template which can be used as your personal and/or business website and portfolio. Designed fully responsive using HTML, CSS3 and jQuery. 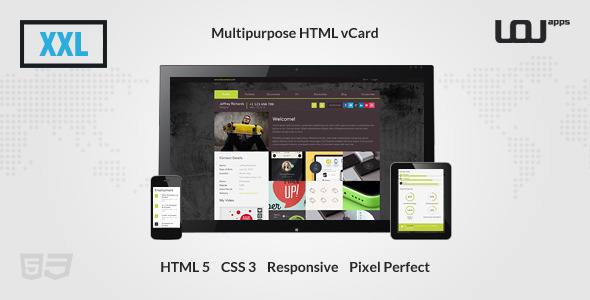 cvCard is a responsive ajax enabled vcard template with Sliding Horizontal Layout. 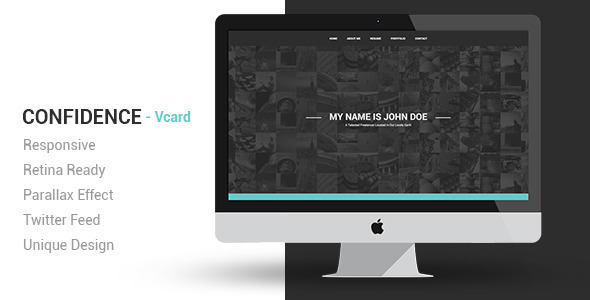 vCard is a minimalistic personal vCard HTML Template, an impressive and professional online vcard, a beautiful portfolio, resume, skills and contact information with Google map. Theme comes loaded with dark and light skin, possibility to set unlimited colors, 14 predefined color schemes and unlimited background colors, 14 predefined backgrounds colors, light and dark color for logo text. There is also possibility to define custom background image. 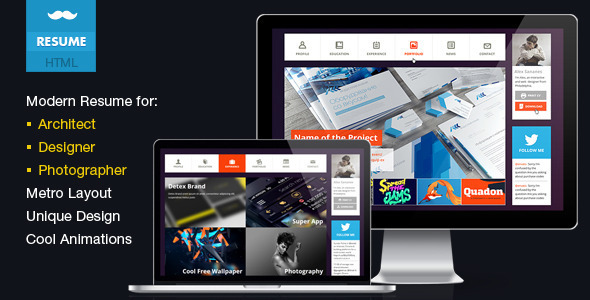 Legion is Resume Responsive HTML Template and designed fully responsive with bootstrap 3. It is designed using HTML5 , jQuery and CSS3. It’s suitable for showing your portfolio, services, or creative bussiness website. 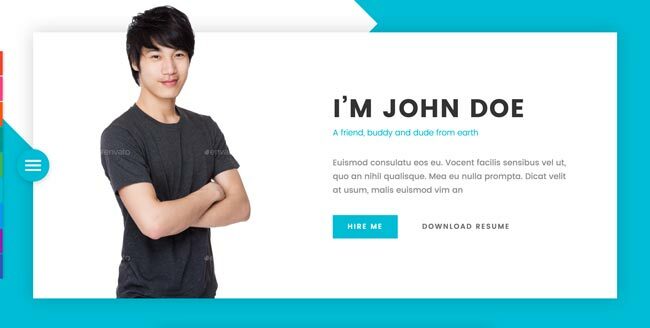 Confidence V-card is an easy cutomizable v-card/portfolio/mini website template made entierly 95% with html and css it allows you to introduce yourself with the most important informations to your features clients or employers. 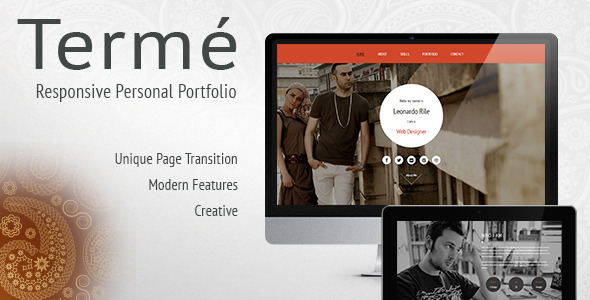 Termé is a stylish modern template for your personal website and portfolio. 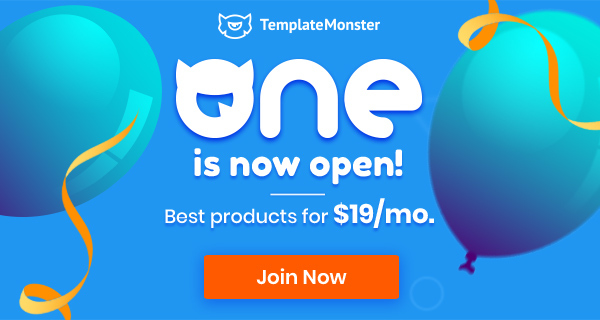 It is a one page template and has a new page navigation which has been designed to give a unique experience to your user. We believe this template would help you stand in the crowd so give it a try! 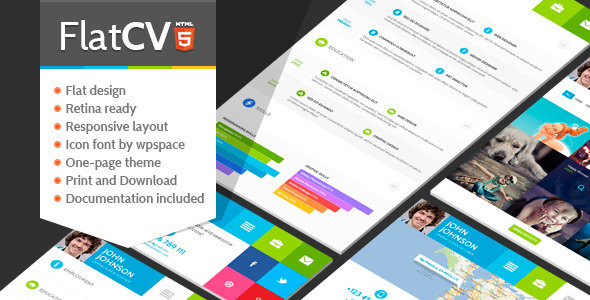 It is fully responsive HTML5 template that is ideal for the self-employed. This is a unique looking template. The CSS and design is flexible, easy to customize and modify. 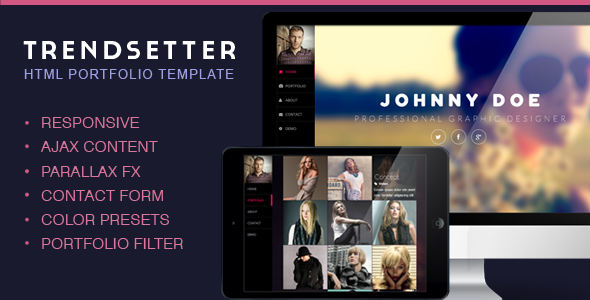 Trendsetter is a responsive portfolio and virtual business card for showing off your work. The AJAX powered portfolio allows for seamless transitions to your projects and the isotope effect neatly organizes your content all on one page. A subtle parallax using CSS3 transforms smoothly guides your backgrounds as you scroll. 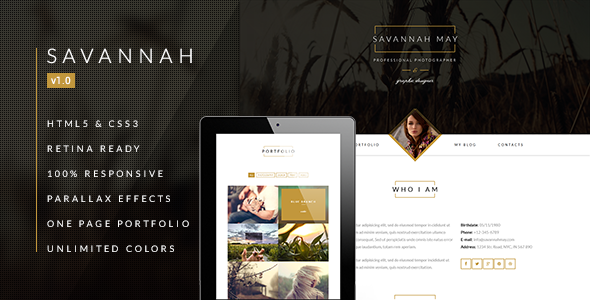 Jenky – Portfolio,Studio And Personal Card. 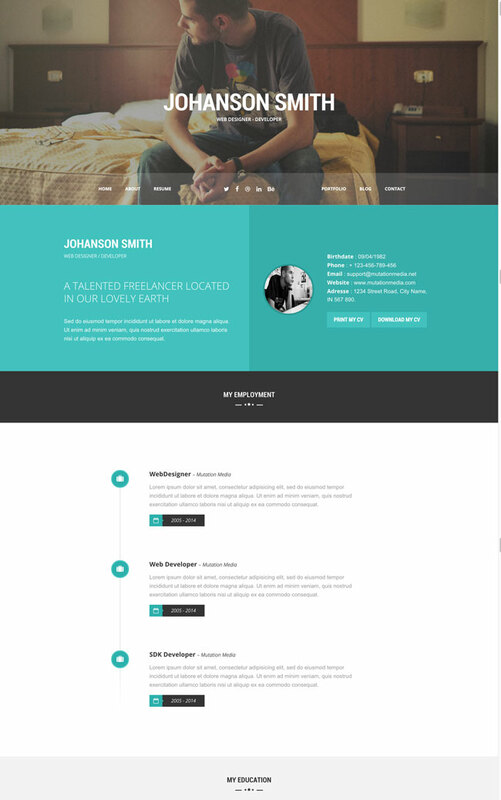 Jenky fully responsive HTML5 template that is ideal for the self-employed as programmers or designers. This is a unique looking template. The CSS and design is flexible, easy to customize and modify.is a unique design based on Bootstrap, is sensitive and is consistent with a wide range of mobile devices. Plus V-card is an easy cutomizable v-card/portfolio/mini website template made entierly 95% with html and css it allows you to introduce yourself with the most important informations to your features clients or employers. Plus V-card can be used also as a mini website for a small compagny that want to be introduced quickly and easly. 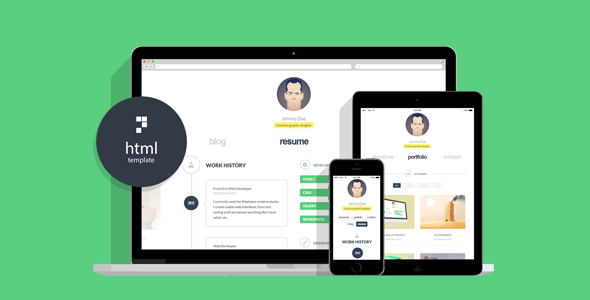 Mustache Multipurpose Resume is a Bootstrap Responsive Online Business Card Resume to show your skills and work. Perfect to promote your work!